Homeowners Association (HOA) dues help you share costs with others in your community. But HOA payments can add a significant amount to your housing expenses. Before you commit to a property with an HOA, get familiar with where your money goes and what to expect with your HOA dues. Management: Homeowners can handle everything themselves, but with more than a handful of units, it’s common to hire a management company (and contractors) instead. The HOA board, along with other members, makes decisions and delegates the work to others. HOA dues: Each homeowner pays HOA fees, typically monthly. Those funds go toward regular expenses, and (ideally) the HOA also saves for future projects and emergencies. They can change: Before you buy property, you and your lender probably evaluate HOA dues to determine affordability. But you use a one-time snapshot, and the dues can change in the future. If that happens, you may find that your housing payments become unaffordable. HOA fees rise when projects need funding, and due to inflation. Ask about the HOA’s history of dues increases, and find out about any planned changes in the works. They don’t cover everything: Your HOA does cover regular costs and planned expenses. But sometimes significant projects and emergency repairs need immediate funding. In those cases, you may need to pay an additional special assessment. Assessments can be several hundred or several thousand dollars (or more). Tip: HOAs keep a reserve fund, which can help absorb large expenses and surprises. Get financial statements and evaluate the reserve fund before you buy a property with an HOA. An insufficient reserve fund is a sign that dues may increase soon, and assessments are more likely when there’s no rainy day fund. They can affect your credit: When you buy into an HOA, you agree to pay HOA dues. If you don’t pay, you owe the HOA money, and the HOA can eventually send delinquent accounts to collections. The HOA can also put a lien on your property, and skipping HOA fees can even lead to foreclosure in some cases. Collection accounts and public records will appear on your credit reports, making it harder for you to get loans or find housing in the future. You pay for things you might not use: HOA dues cover costs for common areas around your property, but you might not enjoy or want everything you’re paying for. That’s a tradeoff of living in a shared space. For example, you might not use the pool or rooftop patio (which tend to increase HOA dues, when compared to properties without those amenities), but you need to pay for them anyway. You probably won’t save on taxes: HOA dues are typically not deductible for your personal residence. 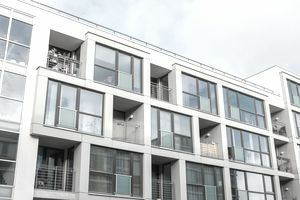 However, if you own a rental property and pay HOA fees, you may get a tax break, and the home office deduction might also provide some relief. Check with a CPA or tax preparer to find out if any savings are available. You may need to pay dues at closing: When buying a property with HOA dues, be prepared to pay for every day you own the property. The good news is that you may have a prorated payment when you sell. You still need insurance: HOA dues pay for a master insurance policy. But those policies typically don’t cover your personal property, the individual home you live in, the interior of your unit, damage that originates from your unit, or your personal liability. Speak with an insurance provider to determine what your risk is, and what type of policy makes the most sense for you. Price those policies before you buy an HOA-managed property. In addition to handling finances and maintenance tasks, HOAs are responsible for setting and enforcing rules in your community. Familiarize yourself with the rules and regulations before you buy. To do so, examine the HOA’s CC&Rs, request recent meeting minutes, and look at properties in the area to determine how strict the rules are. In some cases, you’ll appreciate the rules. They may keep you physically safe, protect your property value, and allow you to enjoy your environment. But some rules may be problematic, and you need to know about potential conflicts before you buy. Ultimately, it’s your choice whether or not to buy a property, and you get to decide if the rules work for you or not.